Michael McFadyen's Scuba Diving - Kyusyu Maru In July 1942, US reconnaissance planes reported that Korean labourers were building an airfield (later to be named Henderson Airfield) on the main island of Guadalcanal in the Solomon Islands, just east of the now capital of Honiara. The completion of the airfield would have given the Japanese a strategic foothold to enable them to attack further south into what is now Vanuatu, New Caledonia and Fiji. Seeing the problems this would cause, the US decided to take action and at daybreak on 7 August 1942, US Marines (supported by US, NZ and Australian warships) stormed ashore at Red Beach. Over the next six months a huge battle ensued, on land, on water and in the air. 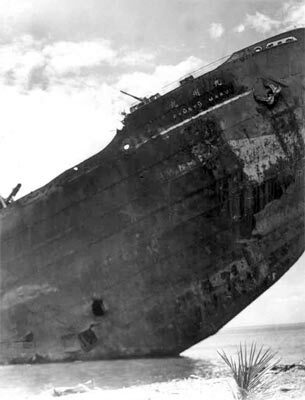 So many vessels were sunk in the waters off Guadalcanal that it was renamed Iron Bottom Sound. These ships included HMAS Canberra, USS Quincy USS Vincennes and USS Astoria all sunk on the night of 7-8 August 1942 in what the US would later call "our worst loss in a fair fight". 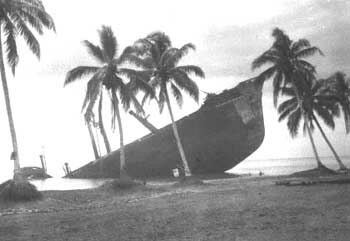 One of the ships sunk at Guadalcanal is the wreck of the Kyusyu Maru but better known by the name of the nearby creek, Ruiniu. The name of the ship is also spelt as Kyoshu or Kyushu. Some say this last one is probably the correct spelling but I will use the more common spelling and the one that was actually on the ship (see photo below). The Kyusyu Maru was a 8,666 ton cargo vessel, 467 feet long and 62 feet wide. A twin screw Mitsubishi Jukogyo 14 cylinder diesel engined powered cargo vessel built in 1937 by Mitsubishi for Harada Kisen K.K., it was requisitioned by the Japanese military for their war effort. On the night of December 7, 1941, at approximately 23:40, a police patrol noticed ships of moored off the coast of the province of Songkhla in Thailand. This si about 1275 kilometres from Bangkok, right on the border with Malaya (now Malaysia). 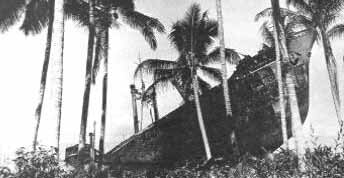 The ships belonged to the Imperial Japanese Navy's Songkhla Invasion Unit (as part of the larger Malaya Invasion Group) under the command of Rear Admiral K. Hiraoka. 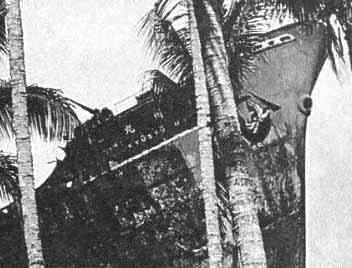 The unit comprised the transport ships Ryujo Maru, Aobasan Maru, Asakkasan Maru, Atsutayama Maru, Kansai Maru, Kashii Maru, Kyusyu Maru (recorded as Kyushu Maru, Sado Maru, Sasako Maru and the Nako Maru. On 13 and 14 October 1942, the Japanese shelled and bombed Henderson Airfield. This appears to have been cover for a Japanese naval force which sailed into Sealark Channel (to the east) on the night of 13 October 1942. By the afternoon of the next day, Henderson was out of action due to the damage (and plane numbers down from 90 to 42 in two days). 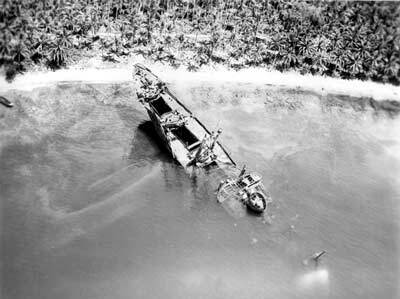 Luckily the SeaBees (CB = Construction Battalion) had built a rough runway south-east of Henderson. This was still useable. 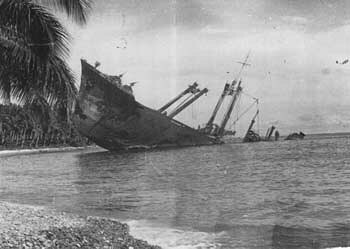 It is reported that the ship first arrived at Guadalcanal on 2 October 1942. It is possible that she unloaded men/equipment and headed back to Rabaul. At dawn on 15 October 1942, five Japanese transports and 11 escorting warships were sighted at Tassafaronga, 16 kilometres west of Lunga Point (near Henderson). One of these ships was the Kyusyu Maru. The transports were attempting to land troops, weapons, supplies and ammunition. There was also a fuel shortage at Henderson Airfield and after a lot of searching for unused drums, 400 drums were found, enough for two days operation by the remaining planes. 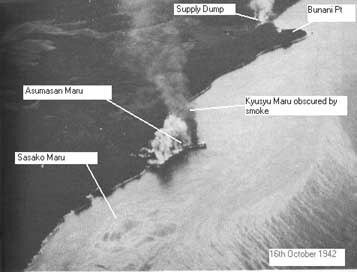 American reports say that on the morning of 15 October 1942, US aircraft attacked the ships, sinking one transport (the Kyusyu Maru) and setting two more alight. All this action was over by 1100. All the Japanese ships were successful in landing all the troops (between 3,000 and 4,000) and 80% of their cargo. 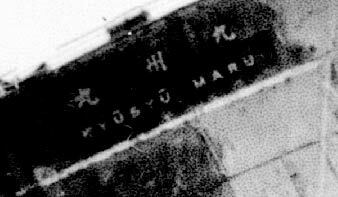 A crew member of Kyusyu-Maru [sic] noted in his memoranda reported that the Asahi, Sasago-maru, Azumasan-Maru and Kyusyu-Maru had gone up in flames in the night. 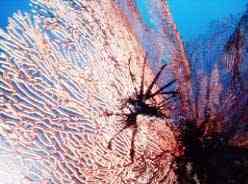 "Many records of the war reported that Kyusyu-Maru, her body ablaze, was rushed onto the beach to save the cargo. But the plain truth is this. A bomb hit the ship squarely on the bridge and our captain and other officers were all killed. But the engineers below deck didn't know that. So they put the ship on full steam till she was stranded on the beach of Guadalcanal". 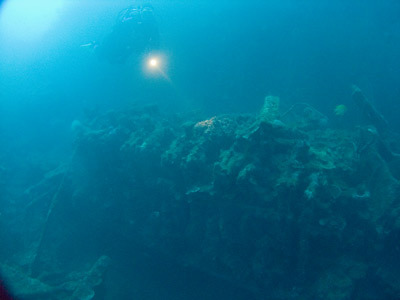 After the war the Kyusyu Maru may have been used for bombing practice by the Americans and in the 1960s there was some salvage work carried out by Australians. Brian Bailey told me in September 2009 that he salvaged both of the props from the ship. He said that they were brass and easy to get off. An interesting event occurred in early 1999 when some people were digging holes for a gate near the beach. In one of the holes the remains of a Japanese soldier were found a metre under the surface. 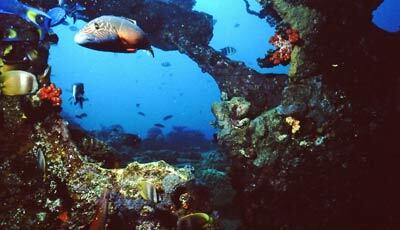 As mentioned, the Kyusyu Maru is about 18 kilometres west of Honiara. Access is through a gated entrance (at which a fee is payable to local landholders) and along a short track to the beach. A GPS location of S9° 21' 11.3" E159° 50' 36.3" (using WGS84 as a datum) will put you on the beach off the wreck. 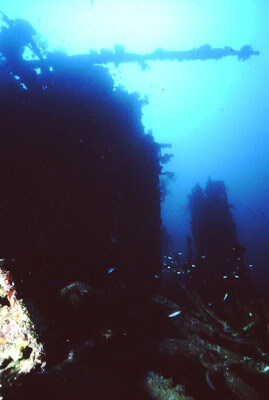 The wreck lies on its port side at an angle of 45 degrees, running from 3 metres down to just over 45 metres. It is only a few metres off the the beach to the start of the wreck. 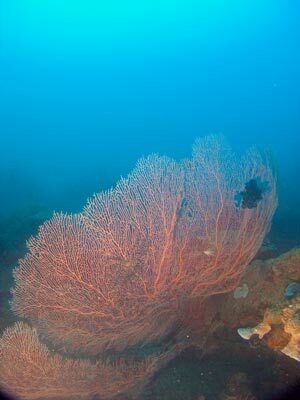 Once you have geared up, enter the water and swim out through the sort of gap in the reef. Go out about 20 metres before descending. The depth here is about five metres and the bottom is sand. Once you are on the bottom, head to the north (with a perhaps a little west in it) till you hit the wreck. 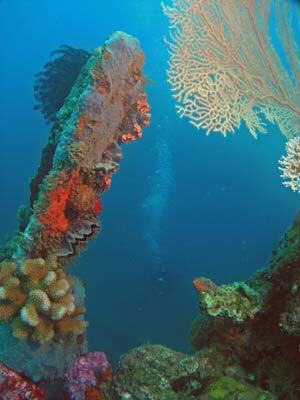 This will take you along the southern side of the shallow section of the wreck. The depth drops fairly rapidly. Within five minutes you will be at 40 plus metres. As you go you will pass the wreckage of the bridge area and the holds. Keep going for now. When you get to the stern, head around it and drop down to the sand. Here you will see the port prop fairing. 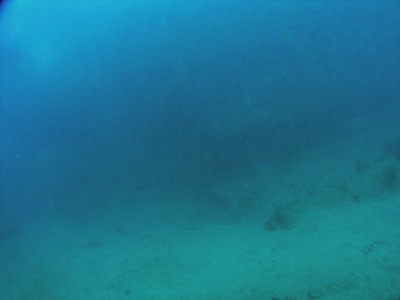 It is mostly buried in the sand and the shaft is totally buried (at least on both times I dived here). 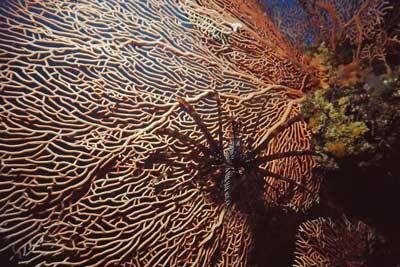 This is under the hull of the ship. It is a bit dark here and hard to get photos. From here, swim past the rudder to the open side. Here you will see the starboard prop fairing and shaft. The fairing is out in the open on the sand but the shaft is partly buried. The depth here is about 46 metres. Once you have seen it, head back around the stern to the main deck. At the stern, the rear gun platform is missing. You can see into the rear compartment here and also enter it. This leads into the rear hold at about 40 metres. 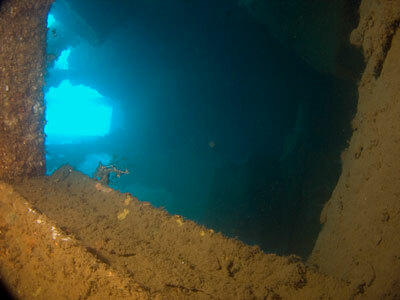 This deeper section is fairly intact and you can easily penetrate the hold and then swim up through the hull to the engine area. Along the way you can see rifle rounds, biscuits (burnt in a fire and preserved under sand), pieces of china and cattle bones (you can tell them as they have clean sawn ends). 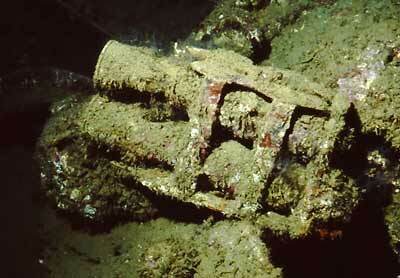 As you swim through the holds, you can see that the starboard prop shaft has fallen from its bearing in one spot. The ship is broken open near the engine area and you can see the major pieces of the engine. In fact, there are two engines here. One is a huge engine that sticks right up. The other is much smaller. Above this engine there is a tank or container of some sort. 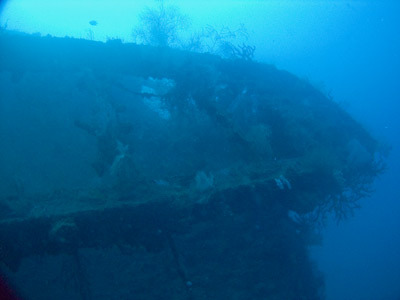 From here you can swim on the outside to the shallower sections which are very broken up and do not even resemble the bow of a ship. 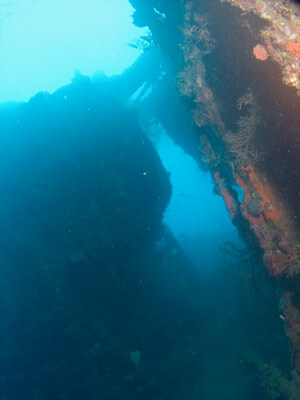 I dived this wreck in 1992 as well as 2009 and from memory of the first dive, it has not changed all that much in all this time. Like all the Honiara wrecks, there is excellent coral and fishlife on the remains near the 3 to 10 metre range and you can easily spend 30 to 40 minutes at the end of a dive just in this area. A great way to spend your surface interval is to go to Fred Kona's Vilu War Museum and then dive the Boeing B-17E, Bessie, Jap Basher. NOTE: The 1992 photos were taken with a Nikonos IV-A using slide film and were mostly only scanned to digital in 2011.